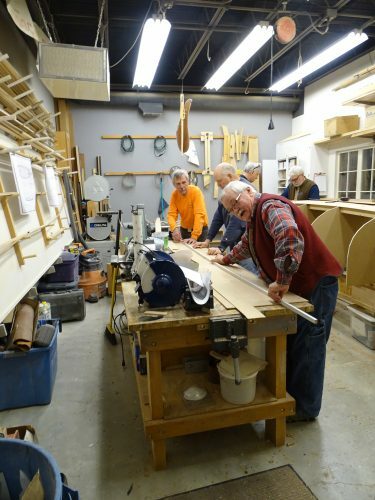 Each year the museum hosts a wooden boatbuilding class, keeping this maritime tradition alive. 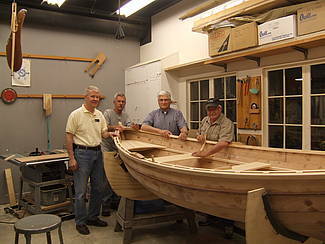 Aspiring boat builders have an opportunity to gain firsthand skills in the age-old craft of building wooden boats. The class is open to beginners as well as experienced woodworkers and includes roughly 25 days of instruction between October and May. The proceeds of the boat raffle benefit the museum’s Operating Fund and at the same time offers you a chance to win over 45 incredible prizes. The raffle drawing will be held during Pumpkin Patch Festival in Egg Harbor over Columbus Day weekend. You do not need to be present to win. Tickets are available for purchase at our Sturgeon Bay location or at most Door County festivals throughout the summer. 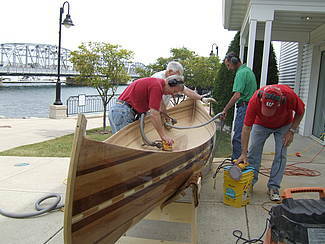 This year’s boatbuilding project will be raffled off with the grand prize being the class’s Adirondack guide boat. It is 15’ in length and will weigh approximately 70 pounds. Debuting in the 19th century, Adirondack guide boats were built for speed. They are still widely acknowledged as the fastest fixed seat rowboats ever built. While guide boats resemble canoes they are rowed instead of paddled, are capable of carrying more weight and are famous for winning countless open ocean races.For more information about the boat raffle, click here.